• PLOT SUMMARY: Limited 70th Frame Variant Cover. Dark Avengers/X-Men Utopia: Part 5 of 6 - Norman's X-Men, as led by Emma and Namor, are the face of mutant law and order! The X-Men look played out of position as Osborn's dark reign falls over California-- but Scott Summers isn't done yet. The X-Men strike at Norman, at H.A.M.M.E.R., at his fraud X-Men and his sham Avengers all at once! 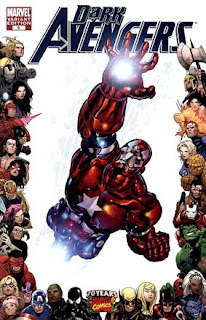 This is the book where, at long last, the Marvel Universe starts to fight back-- and it sets the stage for next month's unbelievable conclusion in Dark Avengers Uncanny X-Men Exodus (2009) #1! Written by MATT FRACTION. Pencils by LUKE ROSS, inks by RICK MAGYAR, MARK PENNINGTON & LUKE ROSS. Cover by MIKE DEODATO.